Mefferts sells the Mickey Mouse puzzle head, Pyramorphix, 2x2x2 cubes by Eastsheen, and many other puzzles. 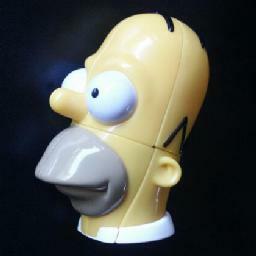 Rubik sells the original 2x2x2 cubes, Darth Maul and Homer puzzle heads. Denny's Puzzle Pages A very nice graphical solution. Matthew Monroe's Page Although a solution for the 3x3x3 cube, it is corners first, and thus applies to the pocket cube as well. Philip Marshall's page A relatively short solution. This puzzle is a simpler version of the Rubik's Cube. It goes under various names, such as Mini Cube and Pocket Cube. The puzzle is built from 8 smaller cubes, i.e. a 2×2×2 cube. Each face can rotate, which rearranges the 4 small cubes at that face. The six sides of the puzzle are coloured, so every small cube shows three colours. This puzzle is equivalent to just the corners of the normal Rubik's cube. It is a little confusing though, because there are no face centres to use as a reference point. This puzzle has many guises, some of which are pictured above. There are the puzzle heads such as the Mickey Mouse puzzle head by Meffert, and the Darth Maul or Simpson heads by Rubik. 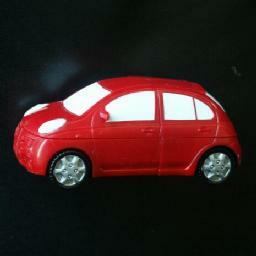 Also shown above is a version in the shape of a Nissan Micra, used for advertising. These puzzles change shape when they are mixed, sometimes in quite amusing ways. 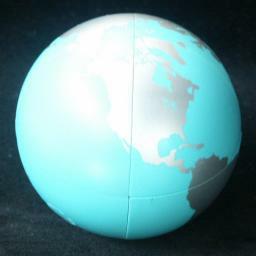 There are various ball versions, such as the Dreamball, the K8-ball, and the Octo. 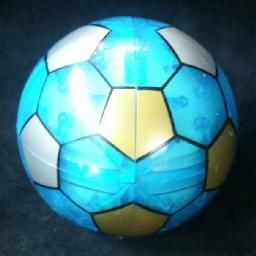 These balls have unique internal mechanisms. All these puzzles can be solved in the same way as the normal mini cube. 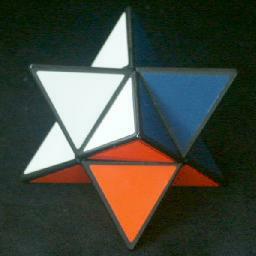 Another related puzzle is the pyramorphix, which is the tetrahedral puzzle shown above. It changes shape when mixed. It is like the cube but where the orientation of four of the pieces does not matter. Because of this, it has a slightly easier solution than the other versions. The Pyramorphix and the equivalent Stern puzzle are covered in more depth on a separate Pyramorphix page. 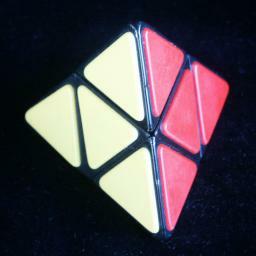 The pocket cube was patented by Ern&odblac; Rubik on 29 March 1983, US 4,378,117. The Eastsheen 2x2x2 cube was patented by Chen Sen Li on 27 October 1998, US 5,826,871. 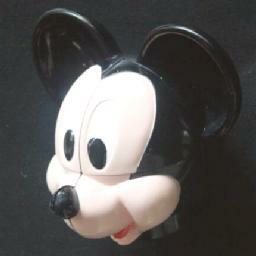 The Mickey Mouse puzzle head was patented by Francisco Josa Patermann on 22 May 1996, EP 712,649. 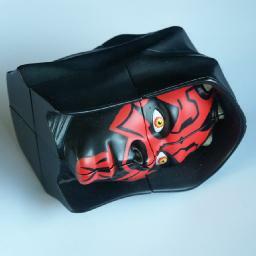 The Darth Maul puzzle head was patented by Thomas Kremer (Seven Towns Ltd.) on 17 April 2001, US 6,217,023. 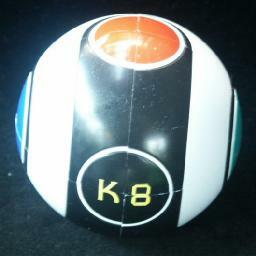 The K-ball was patented by Saleh Khoudary on 11 May 2000, WO 00/25874. This leaves 7!·36 = 3,674,160 positions. Many people have used a computer search to find God's Algorithm, i.e. the shortest solution for each position, as far back as 1981. The results are shown in the table below. It shows that every position can be solved in at most 11 moves (8.7556 on average), or 14 (10.666 on average) if a half turn is considered to be two moves). In Sloane's On-Line Encyclopedia of Integer Sequences these are included as sequences A079761 and A079762. 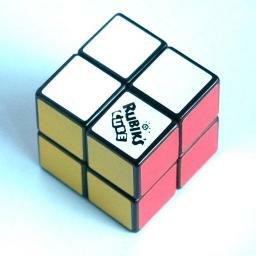 Rubik, the original manufacturer of this puzzle. Let the faces be denoted by the letters L, R, F, B, U and D (Left, Right Front, Back, Up and Down). Clockwise quarter turns of a face are denoted by the appropriate letter, anti-clockwise quarter turns by the letter with an apostrophe (i.e. L', R', F', B', U' or D'). Half turns are denoted by the letter followed by a 2 (i.e. L2, R2, F2, B2, U2 or D2). Note that on this cube the moves LR' is simply a rotation of the whole cube. Similarly FB' or UD'. Therefore moving only three adjacent faces is enough to solve the cube. If we only use the F, R and D faces to solve it, then the UBL corner is never moved from its place, and the other pieces are simply placed so they line up with it. The first solution below will use all the faces because it is based on a solution for the normal Rubik's Cube. Phase 1: Solve the top layer. Decide which colour you want to place on the top face. Then hold the cube so that at least one piece already shows that colour on the top face. The remaining pieces on the top face will be placed relative to that piece. Find a piece in the D layer that belongs in the U layer. Rotate D so that the piece is below its destination and rotate the whole cube to get it to the front right. If all the U layer pieces are already in the top layer though some are wrongly placed then choose any D piece to displace any wrong piece from the U layer. Repeat b-c until the top layer is done. Phase 2: Place the bottom layer pieces, ignoring orientation. Rotate the D layer to get at least two pieces in the correct position, though they may be twisted. Phase 3: Twist the bottom layer pieces correctly. Do one of the following sequences to solve the remaining pieces. Clockwise twists are denoted by a +, anti-clockwise ones by a -. This solution takes at most 24+8+10=42 moves. This solution is loosely based on the Thistlethwaite algorithm adapted for the 2×2×2 cube. It uses fewer moves than solution 1, but is far more complicated since it uses a large table of sequences. Phase 1: Orient all pieces correctly. Choose the colours which will go on the top and bottom faces of the cube. Hold the cube so that at least three of the pieces show one of those two colours on the top and bottom faces. Examine which pieces need to be twisted and in which direction to make the top/bottom faces a mixture of the two chosen colours. The following table lists all possible sequences needed to fix the orientations. The left column shows the twist the pieces need, in the order ULB, UBR, URF, UFL, DBR, DRF, DFL, DLB, where a + means it needs a clockwise twist, a - an anticlockwise twist. Phase 2: Put the pieces in position. Find a tetrad of pieces, i.e. 4 pieces which in the solved cube are not adjacent (i.e. any two of them have exactly 1 colour in common). This leaves the tetrad in the U layer, and the other tetrad in the D layer. Rotate U to get as many pieces from the U layer adjacent to matching pieces in the bottom layer, i.e. forming as many correct columns as possible. If there are 4 columns, then do UF2U2R2U; if there are 2 adjacent columns then holding the cube with those columns in the B face do the sequence F2U'F2U2R2UF2U; if there are 2 non-adjacent columns, then holding the cube with those columns at FR and BL do the sequence R2U2F2U. The cube can now be solved by using only half turns, and at most 4 are needed. This is trivial. This solution takes at most 24 moves (not including cancellations between the steps in phase 2). The following patterns are symmetric, but don't look as nice. U R F2 U F2 R U' Triple swap.